IAA appears to be the most active auxin in plant growth. Auxins are a class of naturally occuring or synthetic organic (carbon-containing) plant growth substances (often called phytohormones or plant hormones) that increase, in low concentrations, the rate of cell elongation in stems, among other influences. All plants have auxins, and the prominent auxin indole-3-acetic acid (IAA) is found in almost all plants examined for auxins, usually in minute amounts. Auxins play an essential role in coordination of many growth and behavioral processes in the plant life cycle. In addition to the definitive function of shoot elongation under proper conditions, auxins also influence phototropism (growth of stems toward light), inhibit cell elongation in roots, impact cell differentiation, inhibit lateral branching, and can impact development of flowers and fruit. The special role of human beings relative to nature has led to a desire to investigate auxins and creatively use this knowledge in practical agricultural purposes. One such use is in the production of synthetic auxins that can act as herbicides. These can disrupt the natural auxin balance in plants, causing abnormal growth of mature cells and preventing the formation of new cells (Davy and Buchner 2006). Auxins used in high concentrations likewise can work as herbicides. On the other hand, one such synthetic auxin, 2,4,5-Trichlorophenoxyacetic acid (2,4,5-T), one of the active agents in Agent Orange, used in Vietnam, has an unavoidable dioxin contaminant identified as harmful to human beings. Auxins, the first hormones to be discovered, have been demonstrated to be a basic coordinative signal of plant development. Davy and Buchner (2006), who state they can be thought of as a plant's replacement for the nervous system, note that they can regulate other hormones, regulate all stages of plant development, and act as a balancer for the plant's development of organs and other structures. Auxins' pattern of active transport through the plant is complex, and auxins typically act in concert with (or opposition to) other plant hormones. For example, the ratio of auxin to cytokinin in certain plant tissues determines initiation of root versus shoot buds. As a result, a plant can (as a whole) react on external conditions and adjust to them, without requiring a nervous system. The most important member of the auxin family is indole-3-acetic acid (IAA). It generates the majority of auxin effects in intact plants, and is the most potent native auxin. However, molecules of IAA are chemically labile in aqueous solution, so IAA cannot be applied commercially as a plant growth regulator. There are two basic groups of auxins. Naturally-occurring auxins include 4-chloro-indoleacetic acid, phenylacetic acid (PAA), and indole-3-butyric acid (IBA). Auxins are often used to promote initiation of root growth and are the active ingredient of the commercial preparations used in horticulture to root stem cuttings. They can also be used to promote uniform flowering, to promote fruit set, and to prevent premature fruit drop. Used in high doses, auxin stimulates the production of ethylene. Excess ethylene can inhibit elongation growth, cause leaves to fall (leaf abscission), and even kill the plant. 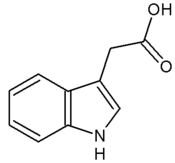 Some synthetic auxins such as 2,4-D and 2,4,5-trichlorophenoxyacetic acid (2,4,5-T) can be used as herbicides. Broad-leaf plants (dicots) such as dandelions are much more susceptible to auxins than narrow-leaf plants (monocots) like grass and cereal crops. The plant cell wall is made up of cellulose and protein, and, in many cases, lignin. It is very firm and prevents any sudden expansion of cell volume, and, without contribution of auxins, any expansion at all. In 2005, it was demonstrated that the F-box protein TIR1, which is part of the ubiquitin ligase complex SCFTIR1, is an auxin receptor. Upon auxin binding, TIR1 recruits specific transcriptional repressors (the Aux/IAA repressors) for ubiquitination by the SCF complex. This marking process leads to the degradation of the repressors by the proteasome, alleviating repression and leading to specific gene expression in response to auxins. On the cellular level, auxin is essential for cell growth, affecting both cell division and cellular expansion. Depending on the specific tissue, auxin may promote axial elongation (as in shoots), lateral expansion (as in root swelling), or isodiametric expansion (as in fruit growth). In some cases (coleoptile growth), auxin-promoted cellular expansion occurs in the absence of cell division. In other cases, auxin-promoted cell division and cell expansion may be closely sequenced within the same tissue (root initiation, fruit growth). In a living plant, it appears that that auxins and other plant hormones nearly always interact to determine patterns of plant development. According to the "acid growth theory," auxins may directly stimulate the early phases of cell elongation by causing responsive cells to actively transport hydrogen ions out of the cell, thus lowering the pH around cells. This acidification of the cell wall region activates enzymes known as expansins, which break bonds in the cell wall structure, making the cell wall less rigid. When the cell wall is partially degraded by the action of auxins, this now-less-rigid wall is expanded by the pressure coming from within the cell, especially by growing vacuoles. However, the acid growth theory does not by itself account for the increased synthesis and transport of cell wall precursors and secretory activity in the Golgi system that accompany and sustain auxin-promoted cell expansion. 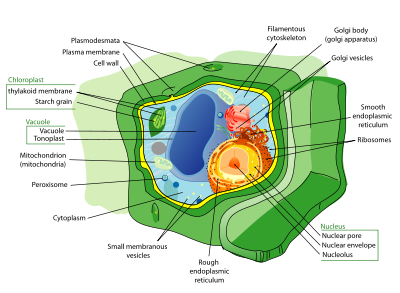 Growth and division of plant cells together result in growth of tissue, and specific tissue growth contributes to the development of plant organs. Growth of cells contributes to the plant's size, but uneven localized growth produces bending, turning, and directionalization of organs, for example, stems turning toward light sources (phototropism), growth of roots in response to gravity (gravitropism), and other tropisms. An important principle of plant organization based upon auxin distribution is apical dominance, which means that the auxin produced by the apical bud (or growing tip) diffuses downwards and inhibits the development of ulterior lateral bud growth, which would otherwise compete with the apical tip for light and nutrients. Removing the apical tip and its suppressive hormone allows the lower dormant lateral buds to develop, and the buds between the leaf stalk and stem produce new shoots, which compete to become the lead growth. This behavior is used in pruning by horticulturists. A 2006 study showed plant-specific pin-formed (PIN) proteins are vital in transporting auxin. PINs also regulate auxin efflux from mammalian and yeast cells (Petraek et al. 2006). Cell elongation. Auxin stimulates cell elongation. It stimulates factors, such as elastins, to loosen the cell walls and allow the elongation. A basic condition to define a substance as an auxin is its ability to increase the rate of stem elongation under proper conditions; however, auxins provide a diversity of functions. Cell division. Auxin stimulates cell division if cytokinins are present. When auxin and cytokinin was applied to callus, rooting can be generated if the auxin concentration is higher than cytokinin concentration while xylem tissues can be generated when the auxin concentration is equal to the cytokinins. Tropisms. Auxin participates in phototropism, geotropism, hydrotropism, and other developmental changes. The uneven distribution of auxin, due to environmental cues (for example, unidirectional light and gravity force), results in uneven plant tissue growth. Sugar and mineral accumulation. Auxin induces sugar and mineral accumulation at the site of application. Vascular tissue impacts. Auxin induces formation and organization of phloem and xylem. When the plant is wounded, the auxin can induce the Cell differentiation and regeneration of the vascular tissues. Root growth and development. Auxin induces new root formation by breaking root apical dominance induced by cytokinins. However, high concentrations of auxin inhibit root elongation and instead enhance adventitious root formation. Removal of the root tip can lead to inhibition of secondary root formation. Apical Dominance. Auxin induces shoot apical dominance; the axillary buds are inhibited by auxin. When the apex of the plant is removed, the inhibitory effect is removed and the growth of lateral buds is enhanced as a high concentration of auxin directly stimulates ethylene synthesis in lateral buds causes inhibition of its growth and potentiation of apical dominance. Ethylene biosynthesis. In low concentrations, auxin can inhibit ethylene formation and transport of precursor in plants; however, high concentrations of auxin can induce the synthesis of ethylene. Leaf fall. It also inhibits abscission prior to formation of abscission layer and thus inhibits senescence of leaves. Fruit growth. Auxin delays fruit senescence. It is required for fruit growth. When seeds are removed from strawberries, fruit growth is stopped; exogenous auxin stimulates the growth in seed removed fruits. For fruit with unfertilized seeds, exogenous auxin results in parthenocarpy ("virgin-fruit" growth). Flowering. Auxin plays a minor role in the initiation of flowering. It can delay the senescence of flowers in low concentrations. The defoliant Agent Orange was a mix of 2,4-D and 2,4,5-T. 2,4-D is still in use and is thought to be safe, but 2,4,5-T was more or less banned in the United States by the Environmental Protection Agency (EPA) in 1979. The dioxin TCDD is an unavoidable contaminant produced in the manufacture of 2,4,5-T. As a result of the integral dioxin contamination, 2,4,5-T has been implicated in leukemia, miscarriages, birth defects, liver damage, and other complications. Agent Orange was sprayed in Vietnam as a defoliant to deny ground cover to the Vietnamese army. Davy, J., and R. P. Bucher. 2006. The story behind the new herbicide MilestoneTM. Livestock & Land News April 2006. Retrieved May 10, 2007. Petrášek, J., J. Mravec, R. Bouchard, J. J. Blakeslee, M. Abas, D. Seifertová, J. Winiewska, Z. Tadele, M. Kubeš, M. Čovanová, P. Dhonukshe, P. Skůpa, E. Benková, L. Perry, P. Křeček, O. Ran Lee, G. R. Fink, M. Geisler, A. S. Murphy, C. Luschnig, E. Zažímalová, and J. Frim. 2006. PIN proteins perform a rate-limiting function in cellular auxin efflux. Science 312(5775): 914-918. Retrieved May 26, 2012. Taiz, L., and E. Zeiger. 2006. Chapter 19. Auxin: The growth hormone. Plant Physiology Online. Retrieved May 10, 2007. This page was last modified on 26 May 2012, at 22:40.